When Exporting you can open the Settings window by clicking the Settings button in the Export window. Note: You can also open the Settings window from the Album Selection window during the Export but note that your settings are not stored for future Exports if you change them at this time. When Publishing you can open the Settings window by choosing Edit Settings… from your publish service’s right click menu. The plug-ins settings described here are applied to each photo that is uploaded. You can additionally choose to override these settings for a specific photo by specifying an alternative value using the metadata settings a photo. 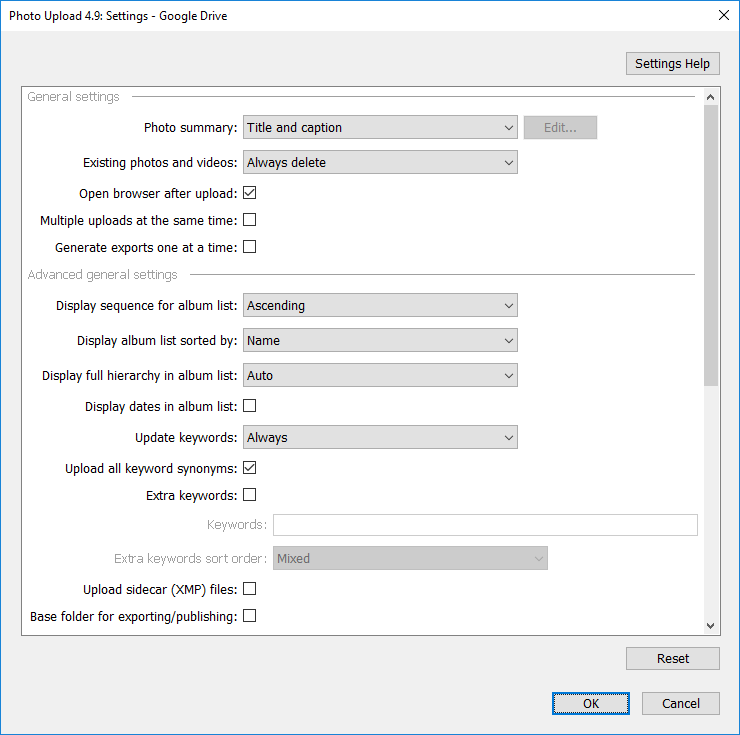 See this guide – Uploading photos – Overriding plug-in settings per photo. Determines how the photo title is put together. The value is determined by an entry in the plug-in’s metadata “Settings” property. Defined by a template. See the help for the Custom Text window. Determines how the photo summary is put together. 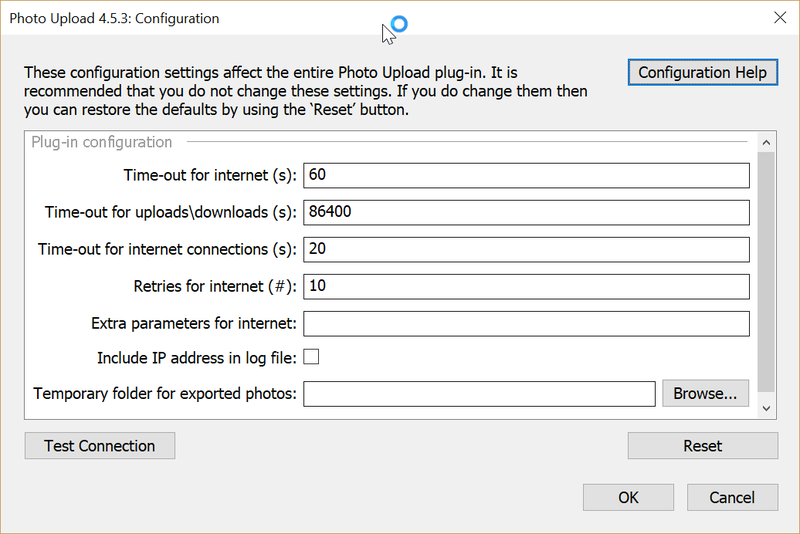 Determines the behaviour when an existing photo is identified on the upload service during an upload. Allows you to view and change the Photo Upload settings before publishing. This setting can only be used when publishing. Publishes the new photos in Lightroom without actually exporting and uploading them. Can be useful to quickly mark photos in Lightroom’s published collections as having been published when you’ve already uploaded them. Determines if the Web page for the album or service is opened in your Web Browser. This setting can only be used when exporting. Allows more than one photo to be uploaded at the same time. Without this, photos are uploaded in sequence, one at a time. This setting can improve upload speed but, because the photos are uploaded in parallel, the order of the uploaded photos may not be the same order as within Lightroom. This setting is only used by the plug-in when the export file format is set to “ORIGINAL”. Forces the plug-in to only render a photo as and when it is its turn to be exported. This setting can only be used when exporting. Lightroom does not allow a publish operation to delay making rendered copy of the photo. Reduces disk usage during export. By default Lightroom tries to render all the export photos in one batch at the start of the export process. This can cause excessive use of the CPU and on large exports can fill up the local disk space with temporary files for exporting. This settings allows a single photo to be prepared for export as and when it is about to be exported – and then the temporary copy of the photo is deleted immediately afterwards to save on disk space. Works around Lightroom not being able to export photos with identical names. Lightroom tries to render all the photos for export in a single temporary folder. This means that filenames for the photos must be unique and Lightroom will append a numeric suffix to filenames to make them unique. This setting only renders and exports one photo at a time in the background and so never encounters a problem with multiple files with identical names. Note 1: Turning on this setting means that you cannot use post-process actions with your export (Lightroom does not apply them). Note 2: Turning on this setting means that you cannot use Lightroom-generated sequence numbers in your uploaded photo filenames. Determines the sort sequence for the album list displayed either during an Export or in the Base Folder setting. Determines the album property used for sorting the album list displayed either during an Export or in the Base Folder setting. Determines whether to show all folders on the upload service, including their hierarchy, or to just show the sub-folders within one parent folder in the album list. Determines if the date the album was created is shown in the album list displayed either during an Export or in the Base Folder setting. Determines when photo keywords are uploaded. Determines when all keyword synonyms for the keywords are exported. Lightroom does not permit plug-ins to check whether or not to export synonyms for individual keywords. This setting applies to all exported keywords and their synonyms. Using this setting for keyword synonyms overrides Lightroom’s “Include on Export” setting for a keyword. This means that keywords can be chosen to be excluded from export, but their synonyms can be exported . Allows you to specify a comma-separated list of extra keywords that will be uploaded with the photos. Allows you to specify the ordering of the extra keywords and where they will appear relative to the other keywords. Determines if an existing sidecar (XMP) file for a Raw photo is uploaded alongside the photo. Determines the starting folder that is used when exporting or publishing. Exporting: the base folder is used to determine the starting folder whose contents are listed in the Album Selection window. If a photo has already been exported then the most recent folder it was uploaded to is displayed instead of the base folder. Publishing: the base folder is used to determine the folder that the base of the publish service hierarchy represents. Any new folders or albums created in that publish service are created beneath the specified base folder on the service. Allows you to specify a name for a sub-folder that indicates that all photos within that sub-folder will not be uploaded. This setting may be useful if you have sub-folders that contain images that make up a combined image, e.g. “source” for images that are part of a panorama or a stacked exposure. Specify which of the sub-folders will be recreated during the export. Allows you to specify a name for a extra sub-folder that is created at the end of the exported folder(s). Determines if part of the photo’s original folder hierarchy (path name) is recreated on the service. See this guide for a tutorial on using this feature. The sub-folder hierarchy is taken from the folder path from where the photo is stored. Determines the base folder on your computer where your photos exist. All sub-folder names from this folder will be used to recreate the folder hierarchy of the exported photos. Allows you to specify a name for a sub-folder that should be removed from the exported sub-folder hierarchy. This setting may be useful if your sub-folder hierarchy contains sub-folders that you do not want to include in your exported sub-folder hierarchy, e.g. you may want to remove a sub-folder that contains your camera model name. The sub-folder hierarchy is taken from the published collection hierarchy from where the photo is located in the Lightroom published collection. Choose one of the photo categories supported by 500px to categorize your uploaded photos. 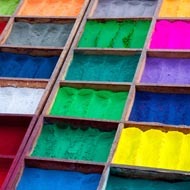 Choose one of the license types supported by 500px that should be applied to your uploaded photos. Determines the privacy setting for uploaded photos. Determines the privacy setting for newly created albums. Determines the source for the text that accompanies each post. Determines whether a text entry window is displayed during export\publish. The text entry window will be populated with the text specified by the “Post text” setting. Determines the source for the caption that accompanies each photo in a post. Determines whether all the photos being uploaded are combined into a single post, or uploaded as separate posts. Determines the published state for newly created posts. This option uploads your photos to an album. You should choose between this option and “Create post”. Determines whether a news feed story is automatically generated for your uploaded photos. See the setting for “New post privacy” for details of Facebook’s restrictions on what privacy levels you can use. This option creates a post on your timeline containing your photos. You should choose between this option and “Upload to album”. Determines the privacy setting for newly created posts. Choose one of the license types supported by Flickr that should be applied to your uploaded photos. Choose when the license for photos should be updated. Choose when the privacy for photos should be updated. Determines the safety level setting for uploaded photos. Choose when the safety level for photos should be updated. Enter a web link that is used when a person clicks on a photo in Pinterest to take them to the source website for that photo. Choose this option to export photos to a folder on your computer. Determines the base folder on your computer where your exported photos (and their individual sub-folder hierarchies) will be copied. Adds the exported photos to this catalog, so that you can see the exported photos in Lightroom’s Folders panel. Choose this option to export photos to one of your existing Lightroom publish services that use one of the Photo Upload services. Allows you to specify the existing publish service (that is based on a Photo Upload service) to export your photos and their sub-folder hierarchies to. Allows you to always create an additional album (published collection) for your photos when exporting to a publish service. This is useful when you have folders on your computer that contain both photos and sub-folders. Note that Lightroom’s publish services have a restriction that computers do not, in that folders can only contain sub-folders and albums can only contain photos. Determines the date given to each post. The current date is used. The photo date is used. Enter a web link that is used to denote the source for the photo. Determines the source for the text that accompanies each tweet. Determines whether all the photos being uploaded are combined into a single tweet, or uploaded as separate tweets. This option uploads your photos to the WordPress site’s Media Library. You should choose between this option and “Create post”. Determines whether links are created for uploaded Raw files to any corresponding non-Raw photos in the same album. You can use the Custom Text window to define a template for the text that will be assigned to the setting using it. Tokens can be used to insert photo specific data into the spacing and words you specify. The value is taken from one of the metadata properties that Lightroom makes available (see the list below). The token names are not case sensitive. When creating or editing a collection or collection set within a publish service the following settings may be available depending on the upload service selected. The album/folder is created on the upload service. Specifies that this collection/collection set is redirected (i.e. linked) to an album/folder on the upload service. Any photos published from a collection with this setting will be uploaded to the redirected album on the upload service. 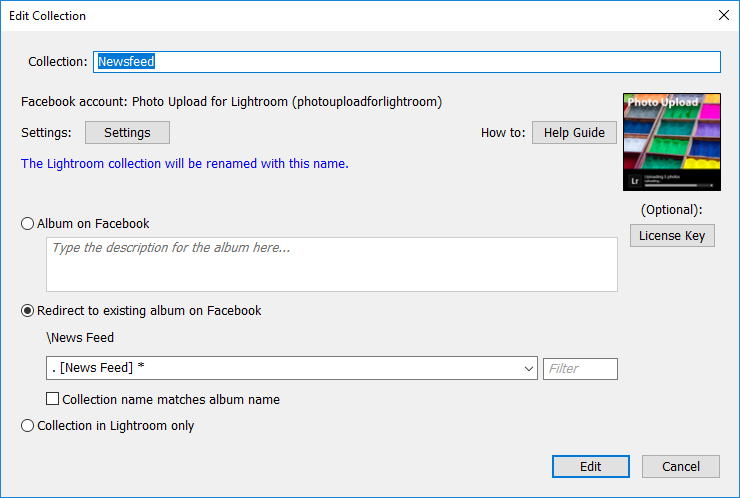 You can name the collection in Lightroom differently to the album on your upload service. 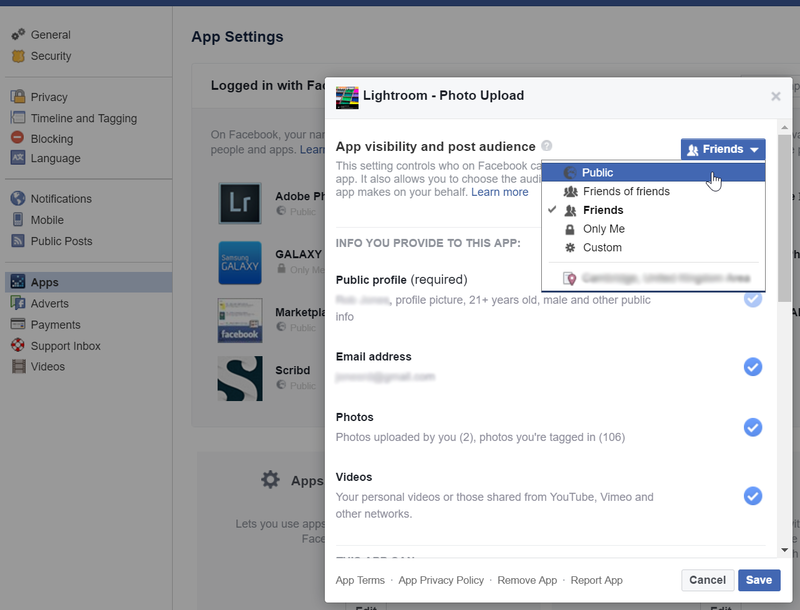 For Facebook, using this settings allows photos to be uploaded to the News Feed (the “Wall”). This setting also allows you to create published collections that upload to the root folder on an upload service (if applicable to that upload service). This setting sets the collection name to be the same as the selected album name on the upload service. An album/folder is not created on the upload service. The collection only exists within Lightroom. When the upload service does not directly support creating albums, all collections and collection sets have this setting selected, e.g. for Twitter or WordPress. When creating or editing an album or folder within a publish service the following settings may be available depending on the upload service selected. Time (in seconds) that an internet operation is permitted to take before it is cancelled. If the operation does time-out, then the operation is retried in accordance with the “Retries for internet” setting. Time (in seconds) that a potentially long internet operation is permitted to take before it is cancelled. Long internet operations include uploading and downloading photos and videos. Time (in seconds) that the connection part of an internet operation is permitted to take before it is cancelled. The number of times an internet operation is retried before the plug-in indicates the operation has failed. Only operations that have reached the time-out and operations that are indicated by the remote server as needing a retry are retried. A place to enter additional parameters that may help with debugging internet operations. Determines whether your machine’s IP address is included in the log file. The IP address is retrieved by communicating with ipecho.net. For security reasons this setting is disabled by default. Including the IP address in your log file may help when troubleshooting. Allows you to choose an alternative folder that Lightroom will use to store temporary copies of the photos to be uploaded. Any folder path specified here will override the “Export Location” settings specified in the main Export/Publish Service window. This Test Connection button opens the Test Connection window which automatically tries to verify your internet connection by communicating with a representative list of mainstream websites. 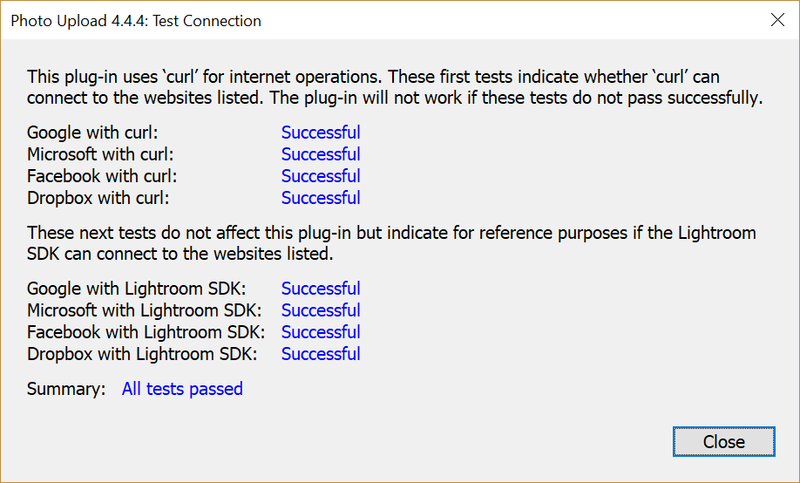 If the Test Connection window cannot connect with a site then this is reported.